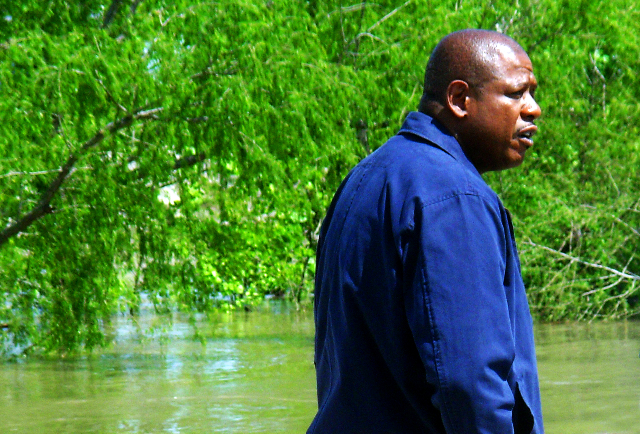 Forest Whitaker in New Orleans. Giuliano photo. Whitaker in a moment of contemplation. He is mourning the death of his friend Hughie. When morning comes, with the light, he joins the world again. Erie praying for connection with the Night Clerk played by Frank Wood. O'Neill was a reticent man, but inside he seems to have been quite a talker. Erie makes a hard point on his first throw and knows this luck has returned. Gotcha moment Gambling is a link to the universe and Dame Fortune. 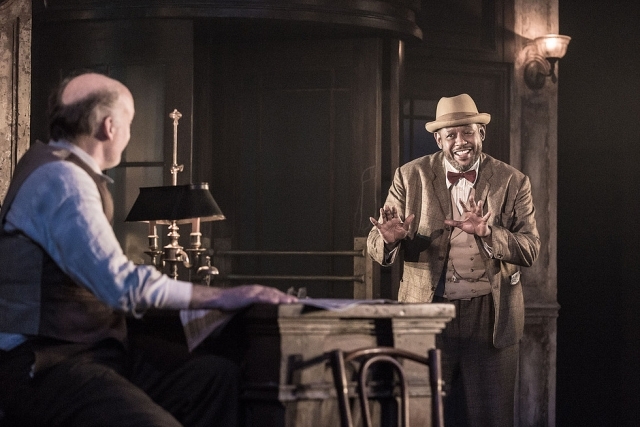 Production photos: Marc Brenner courtesy Polk & Co.
Get off the subway at any stop these days and you are greeted by the warm inviting face of the incomparable Forest Whitaker. His current director, Michael Grandage says he is fearless. After a lifetime of film work, Whitaker is now hitting the stage boards in New York. At the Schomberg Library early in the week, Whitaker was asked what it was like to walk on stage before a live audience. He grinned, "How do I get out of here?" 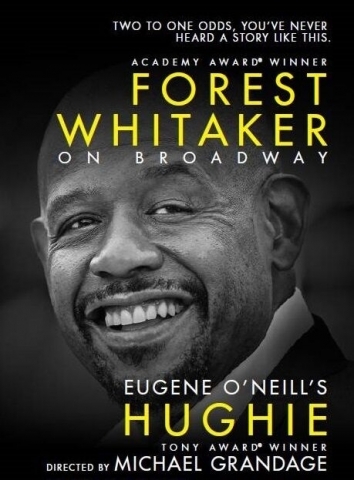 You'd never know that he was uncomfortable telling Erie Smith's stories in Eugene O'Neill's one act play Hughie. Oh, he fears the guys he's borrowed a hundred dollars from for a fabulous wreath for his night clerk friend Hughie. The Winner's Circle wreath, a horseshoe of roses on which the phrase, "Good-by Old Pay" is printed in forget-me-nots, enlivened the funeral. 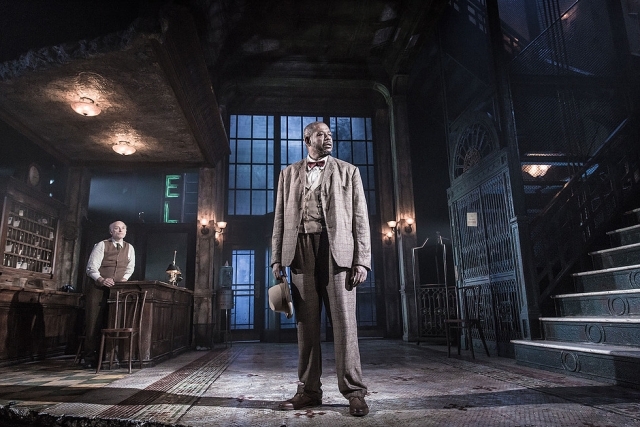 How will the goons find him in his fleabag of a hotel just off Broadway, perhaps in the very location of the Booth Theatre where Hughie is now running. O'Neill was born in the neighborhood. His father of course was a great actor. But the hotel where a new Night Clerk now greets Hughie has long ago seen its best times. Al Pacino remarked that the internal emotional directions O'Neill wrote for the Night Clerk, who doesn't have more than twenty speaking lines in the play, should be read by the same actor playing Erie. Whitaker and director Grandage have a different idea. The interior emotional directives are a jumping off point for Charles Hughes as he tries to get through his night shift. Because Erie can not seduce Mr. Hughes with the stories that helped him connect with Hughie, he turns to us, the audience. He looks to us for connection until Hughes catches on to one of Erie's thoughts. We are open to Whitaker's charm as Erie. Why is the Night Clerk so cut off? Why are Erie's tales so funny and life-engaging? Brian Dennehy played the role in Chicago in 2010 in a double bill with Krapp's Last Tape. It felt heavy. And if you belabor the message of loneliness, alcoholism, gambling, poverty, dawls and bangtails, maybe it is a downer. From the moment Whitaker enters, there is an incredible lightness of being. Even as he creeps to the window which faces the street, he tiptoes the light fantastic, as though he did not want to be heard. Perhaps he is anticipating a response from Mr. Hughes. Or perhaps he is an optimist and believes a connection will be made with enough stories and a long enough night. Grandage has extended the real time notion of O'Neill, who wrote the play to take place between 3am and 4am. Here, with musical interludes accompanying the street cars and the garbage trucks, we actually see the sun rise at the moment of connection between the two men. Christopher Oram's looming lobby, with the cement composition of the floors piled on each other, and the windows dirty in the dark, with only the E and the L of hotel showing, and reminding us of the El too, perfectly captures the seedy world. Yet outside night light and then day infuses the height of the lobby. Even when Erie and the Night Clerk agree on what a racket life is, they find too much steel and stone to burn down. There's always something left to start with: this hotel lobby! Frank Wood, who is on the set from the moment the theatre opens, playing in real time, is a formidable Night Clerk, numbed by the shift, but lightening with the sun. With the sun, with his new friend who shares the pleasure of contemplating gambling wins, the con man's confidence, lost when Hughie died, may return. 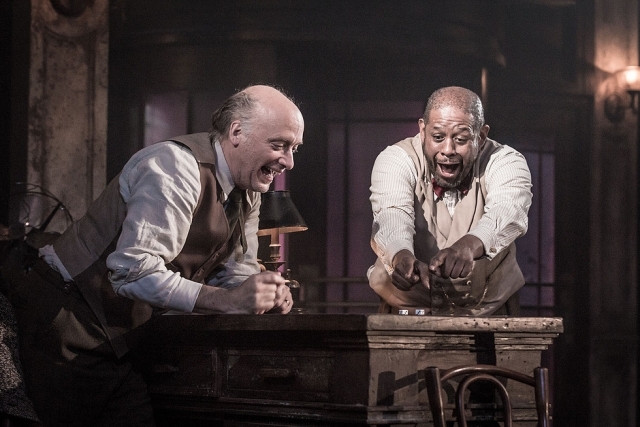 Grandage has made this tale of connection come alive as Whitaker first captures the audience and then his life mate, the Clerk. "Whitaker has said he looks forward to doing a musical! Maybe he should go see James Conlon as teh LA Opera. Like Conlon's protegee Morris Robinson, Whitaker started life as a football player and opera singer. I am sure he and Conlon would hit it off!"